These tough rubber toys were developed for and by pet owners in order to provide a superior outlet for interactive fun between dog and owner, as well as for the play and exercise of the dog by itself. 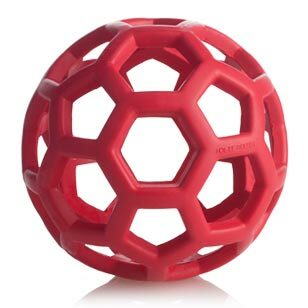 A bouncer, fetch, tug, and treat ball all rolled into one. Ideal for a smaller to medium size dog. Spread the holes apart and stuff a favorite toy or treat inside. Hours of entertainment and good exercise. Color: Assorted colors will vary based on the inventory on hand at the time of your order.